The 2019 Summer Applications will open on December 7, 2018. Click here to access the application portal. The Human Oncology and Pathogenesis Program (HOPP) Summer Student Program is designed for high school students who are interested in pursuing careers in the biomedical sciences. Students will have a chance to take part in independent research projects under the direct mentorship and guidance of a HOPP principal investigator (PI). The PI matches each student with a mentor — typically a senior member from the lab, such as a postdoctoral fellow, graduate student, or research technician. At the end of the summer, the students will be expected to present their research project at a poster session. The students will also have the opportunity to explore outside of the laboratory by participating in a variety of events. These extracurricular activities contribute an additional facet to the internship and allow them to become fully immersed in the world of translational medicine and research. The events are hosted by programs throughout Memorial Sloan Kettering, including the Office of Diversity, various Memorial Hospital clinical departments, and Human Resources. In 2016, the program provided 26 students with a chance to find out more about careers in translational research. Students practiced novel techniques for conducting research experiments and attended enriching training sessions and tours designed to sustain their curiosity for science. The Human Oncology and Pathogenesis Program (HOPP) Summer Student Program is designed for high school students who are interested in pursuing careers in the biomedical sciences. The program runs for eight weeks in the summer and is an intensive lab research experience. 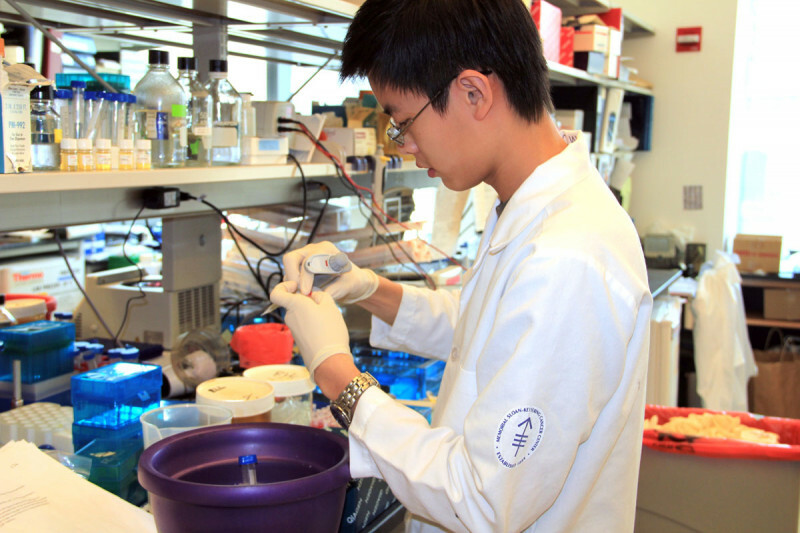 2011 student Chen Wei works independently in investigator Ross Levine’s laboratory. 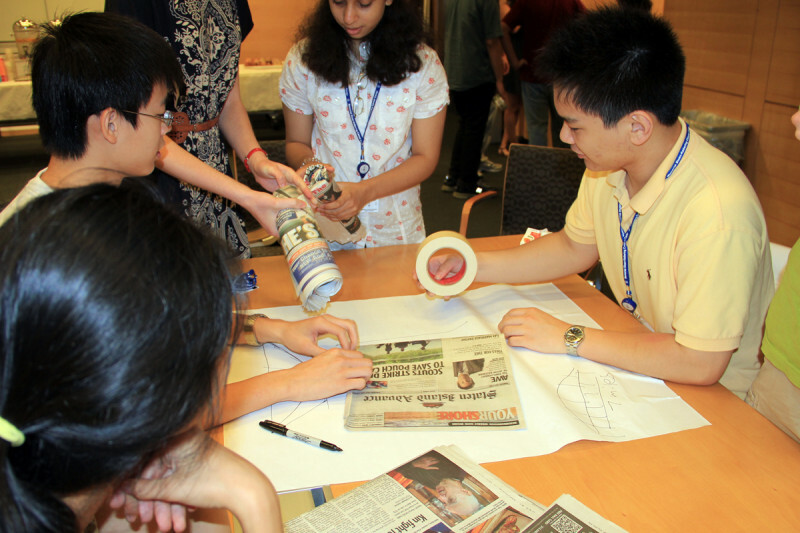 Students collaborate on a team-building project. HOPP faculty members James Hsieh and Emily Cheng discuss their work with participants in the summer program at a luncheon. Lab Manager Adriana Heguy gives students a tour of the Geoffrey Beene Translational Oncology Core Laboratory. Debyani Chakravarty, a postdoctoral fellow in Cameron Brennan’s laboratory, serves as a mentor to summer student Catherine Colford. Postdoctoral fellow Wenhuo Hu of Christopher Park’s laboratory offers advice to summer student Syed Rahman. 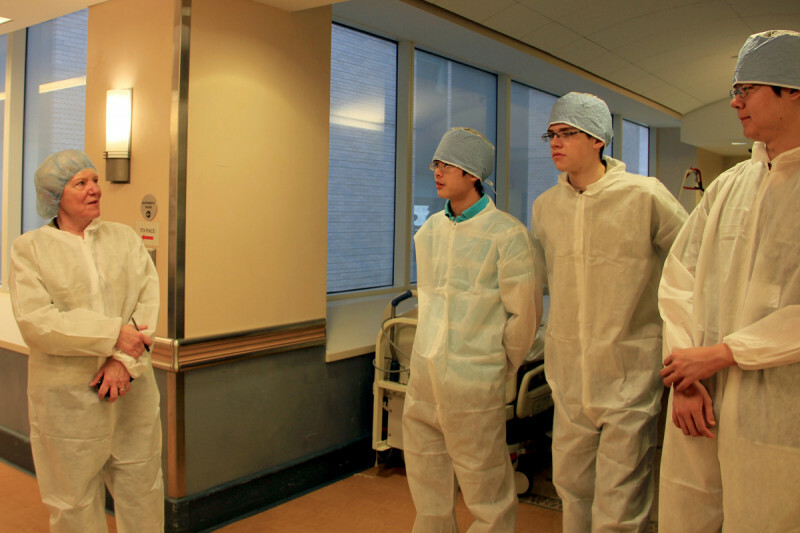 Nurse leader Carol Cass gives students a tour of the operating room. 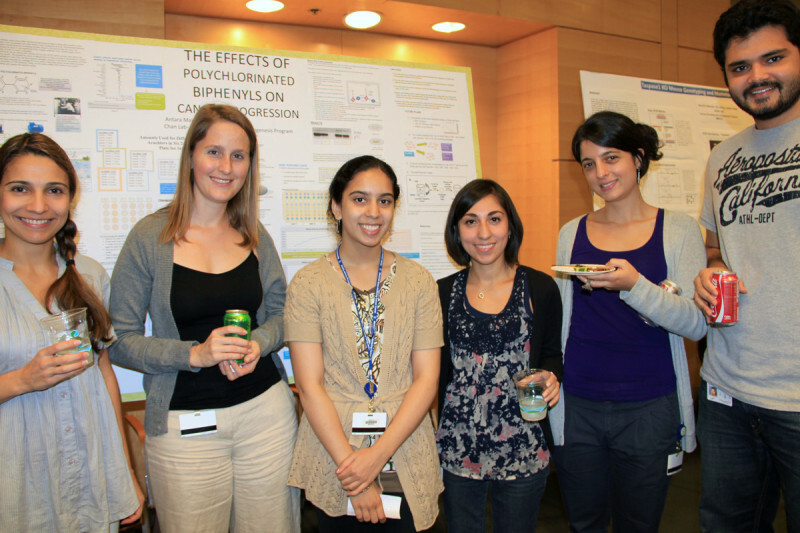 Summer students mingle with members of HOPP labs at their end of summer poster session. 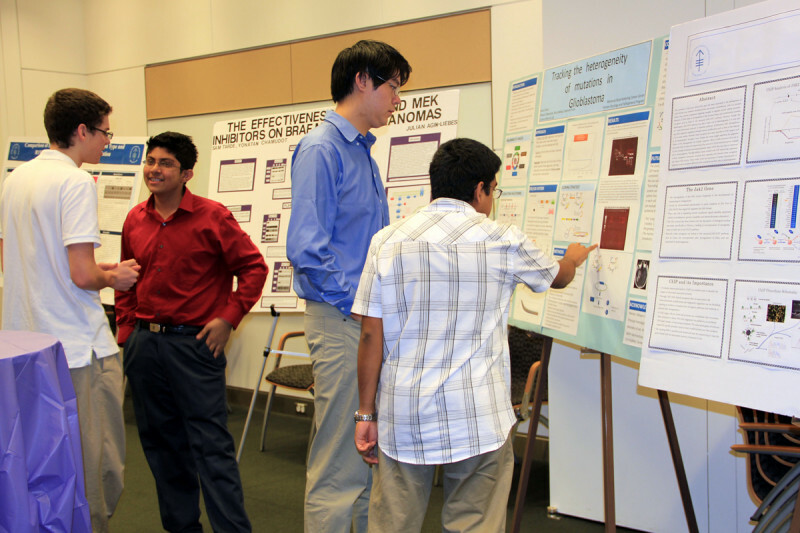 Students present their work at their end of summer poster session. 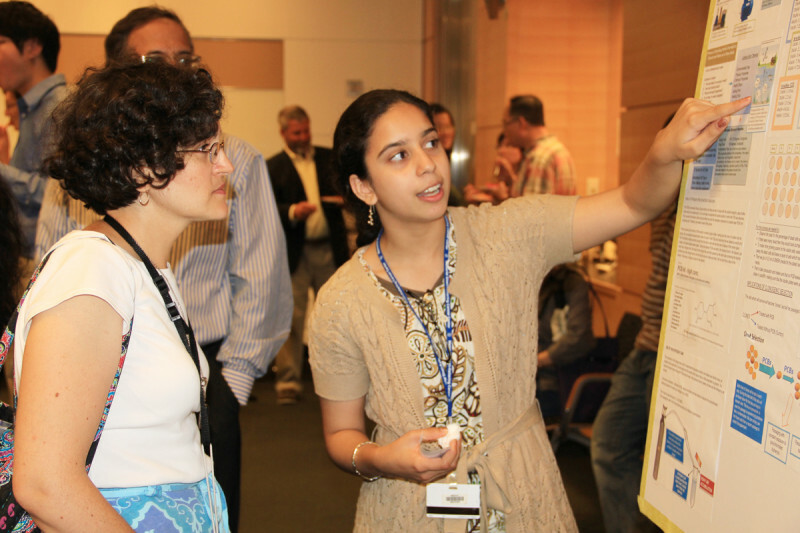 2011 student Antara Majumdar presents her research at a poster session. 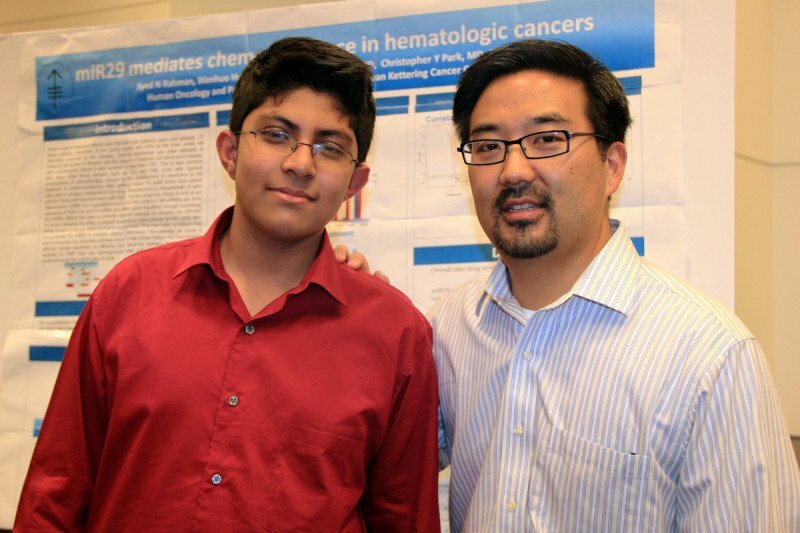 2011 student Syed Rahman with his faculty advisor, researcher Christopher Park at the poster session. HOPP Program Coordinator Erika Bernardino presents student Chen Wei with his certificate of completion at the end of the summer program. The 2011 summer students pose for a photo after their poster session. If you are a high school student who is interested in science, our summer program offers an opportunity to work in a state-of-the-art laboratory facility and explore the kinds of questions that researchers are asking today. In addition, you will have a chance to expand your network of connections with other students and learn more about departments involved in clinical research at Memorial Sloan Kettering. 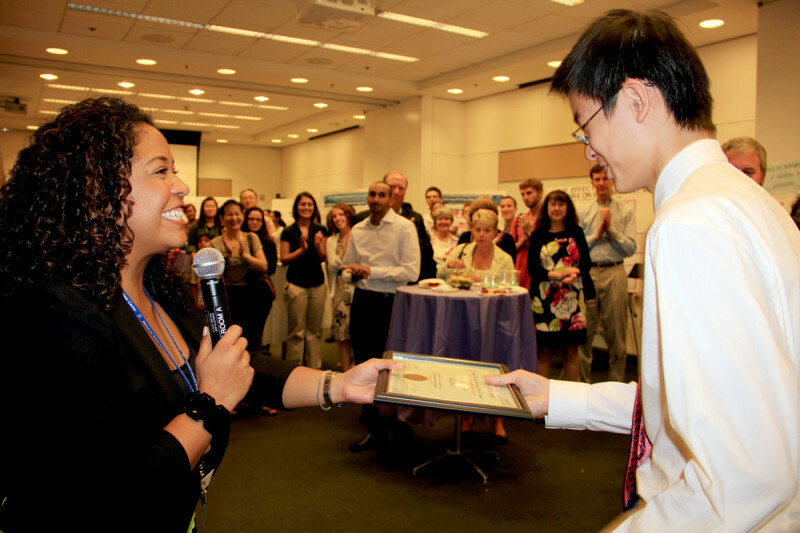 Ultimately, the HOPP Summer Student Program offers students a chance to discover what careers in science are like, make advances toward future career goals, and contribute to the mission of the Human Oncology and Pathogenesis Program and Memorial Sloan Kettering Cancer Center. HOPP seeks high school students in the New York City Tri-State area who are intelligent, self-motivated, and passionate about science to join our 2018 Summer Student Program. We encourage students from disadvantaged and underprivileged backgrounds to apply. 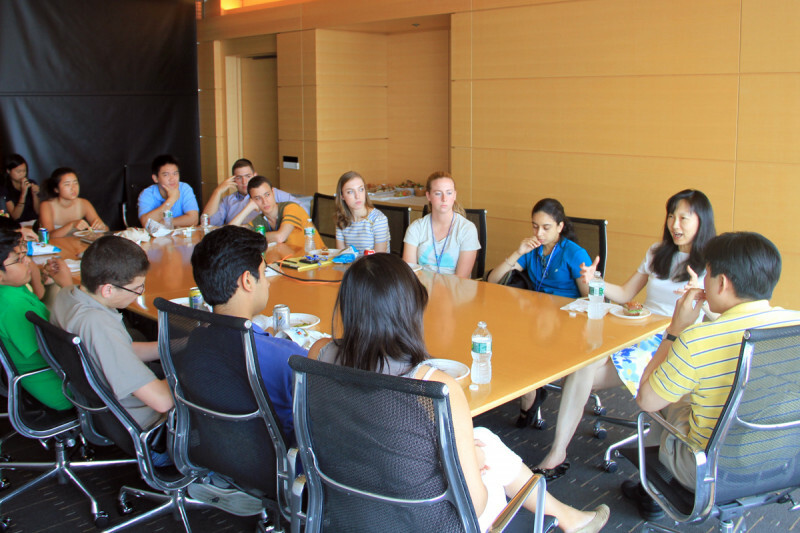 If you still have any general questions about the HOPP Summer Student Program or about your application, you can contact us at HOPPSummerProgram@mskcc.org or 646-888-2013. View our current HOPP Summer Student Program brochure.